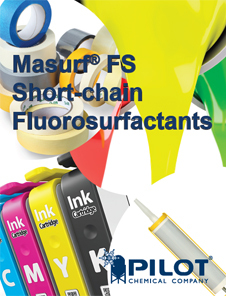 Masurf® FS-630 DB by Pilot Chemical is characterized as a 30% active C-6 based fluoroaliphatic sodium sulfosuccinate in a water/2-(2-butoxyethoxy) ethanol solution (DB). It is a superior surface tension and interfacial tension reduction agent for wetting and leveling performance unobtainable with silicone, acetylenic or traditional hydrocarbon surfactants. It is stable in non-ionic and anionic systems. It results in improved film uniformity in floor finishes, water-based coatings. 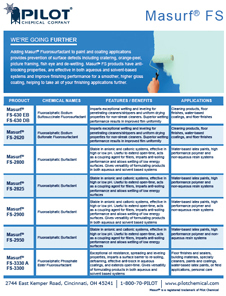 With typical use levels of 50-500ppm, Masurf® FS-630 DB is effective at very low concentrations and together with traditional hydrocarbon surfactants, can contribute properties not possible with either material alone. It is consistent with the goals of the voluntary U.S. EPA 2010/15 PFOA Stewardship Program. It is pre-registered in REACH. It is listed on AICS, NDSL, IECSC, EINECS, PICCS, TSCA and New Zealand Inventory. It has a shelf life of 5 years.